2nd time I've stayed now and I'll stay again, budget motel by it suits my purpose. Can't hear the traffic either. Staff are very pleasant . For what what we paid this is an excellent place to stay. We were both very happy to have stayed here! Thank you for your staying in our hotel. We will keep to improve our services and facilities. Hope all guests enjoy to stay in our hotel. Enjoyed staying there. Room small but cannot help that. Room very clean. Many thanks for stayed in our hotel. Hope to see you again. Noisy by night on street, and unusual odour on stairs, but very handy to cbd, and well kept room, with excellent bathroom. Many thanks for stay in our hotel. We will keep to improve our services and facilities. Thanks again. Many thanks for stayed in our hotel. We will improve our services and facilities. Hope all guests enjoy to stay in our hotel. Thank you for stayed in our hotel. We will improve our facilities. Hope all guests enjoy to stay with us. Efficient, economic and next door to our venue. Could ask for nothing more. Many thanks for stayed in our hotel. We will keep to improve our facilities and services. Hope all guests enjoy to stay in our hotel. Many thanks for stayed in our hotel. We will do our best services and hope all guests are happy to staying in our hotel. Thank you for stay in our hotel. We will keep to improve our service and facilities. Hope all guests enjoy their accommodation in our hotel. Many thanks for stayed in our hotel. We will keep to improve our services and facilities. Hope guests enjoy to staying in our hotel. Very happy with my stay...price was reasonable...rooms were clean...staff were friendly and polite and helpful...not one complaint about my stay. Many thanks for stayed in our hotel. We will keep our hotel as a comfortable, affordable and friendly motel. And keep to improve our facilities. Hope every guest enjoy the accommodation in our hotel. Our experience was very good. The location was perfect for what we needed. The only issue is car parking. To find secure parking we had to walk a bit to and from the car but other than that no complaints. Perfect position if using public transport. Many thanks for stayed in our hotel. We will keep to improve our services and facilities. Hope to see you soon! Location was perfect for my work in the City, could leave car and walk. Many thanks for stayed in our hotel. We will keep to improve our facilities and services. Hope to see you again. 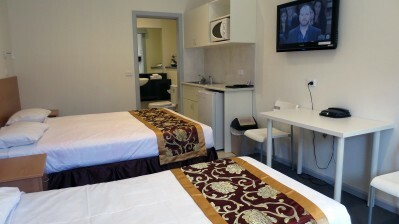 We had a great experience at Flagstaff City Inn Melbourne. The room was great, the staff were friendly and it was in a great location. I would definitely stay there again. Many thanks for stayed in our hotel. We will keep improve our services and facilities. Hope to see you again! We were happy with our stay but glad that our mother was unable to join us as she would've struggled with the steps/staircases and the shower over the bath. Thank you for stayed in Flagstaff City Inn. We will keep to improve our services and facilities. Hope all guests enjoy their accommodation in our hotel. Thanks. Have stayed at this venue a number of times, and plan to stay there again. Thank you for stayed in our hotel. We will do our best to improve our services, renovate our rooms and improve our facilities. Hope all guests enjoy to stay in our hotel. Had a fantastic experience, very happy with service and staff, highly recommened. Many thank you for stayed in our hotel. We will improve our services and facilities. Hope all guests enjoy to stay in our hotel. Very good. Will definitely stay again. Staff were very helpful, great value for money! Many thanks for chose our hotel. We will keep to improve our services and facilities. Hope to see you again! Many thanks for stayed in our hotel. We will improve our services, hope all guest enjoy to stayed our hotel. Surprisingly quiet location within walking distance of many useful shops, sites and trams. Very happy. Many thanks for stay in our hotel. We will check the room air-condition, and arrange maintenance for all rooms. improve our services. Hope all guests enjoy to stay our hotel. We enjoyed the stay and the location was great for us and close to the areas we wanted to explore, the City tram was within walking distance which was perfect to get around. Many thanks for stay in our hotel. We will keep to improve our rooms facilities and services, hope all guests enjoy the accommodation in our hotel. Was good apart from the wifi connection being very poor. Easy to book. Beds were comfortable. Shower was easy to use. Many thanks for stayed in Flagstaff City Inn. We will keep to improve our facilities and services. Hope all guests enjoy the accommodation in our hotel. Many thanks for choose Flagstaff City Inn. We will improve our services. Hope to see you again. Many thanks for chose Flagstaff City Inn. We will keep to improve our hotel and rooms facilities. improve our services. Hope all guests enjoy to stay in our hotel. Many thanks for stayed in our hotel. We will improve our facilities and services. Hope to see you again! Many thanks for chose Flagstaff City Inn. We will improve our facilities and services. Hope all guests enjoy to stay in our hotel. Everything you need for a great short break. Hotel is older, but the accommodation is very clean & comfortable for the price.Not too far from the city centre if you don't mind a little bit of walking. Staff are very friendly. Many thanks for stayed in our hotel. We will keep to improve our facilities and our services. Hope to see you again. Many thanks for stayed in our hotel. We will keep to improve our services and facilities. Hope all guests enjoy the accommodation at our hotel. For a place to Southern Cross Station the hotel was ideal. Distance from station was easy to get to. Great value for money. Many thanks for stayed in our hotel. We will keep to improve our services and facilities. Hope all guests enjoy the accommodation in Flagstaff City Inn. Many thanks for stayed in Flagstaff City Inn. We will keep to improve our services and room facilities. Hope our all guests enjoy accommodation in our hotel.